In July, U.S. Sens. Roy Blunt, R-Mo., and Claire McCaskill, D-Mo., as well as U.S. Reps. Ann Wagner, R-Ballwin, and William Lacy Clay, D-University City, sent a letter to DOE requesting the transfer. Their request was based on new information suggesting that some of the radioactive waste at the landfill could be from a source not affiliated with the Cotter Corporation. If that were true, it might justify turning over the radioactive cleanup to Corps under its Formerly Utilized Sites Remedial Action Program, also known as FUSRAP. "At this time, neither the Department of Energy (DOE) nor the U.S. Army Corps of Engineers (USACE) is in possession of new information suggesting that non-Cotter affiliated material may be present at the West Lake site. However, should new information be received, DOE, in consultation with USACE, would assess whether it merits a renewed inquiry into the site's inclusion into FUSRAP." The offices of Blunt, Wagner and Clay did not immediately respond to requests for comment. In a written statement, a spokesperson for McCaskill, Sarah Feldman, said their understanding is that the matter is not closed. "Claire is continuing to engage with her colleagues, the department, and with stakeholders on the ground," Feldman wrote. St. Louis Public Radio obtained a copy of the DOE's response to Blunt on Thursday evening at a community meeting about the West Lake Landfill. Missouri's congressional delegation has sent a letter to the U.S. Department of Energy asking the DOE to transfer responsibility for the cleanup at the West Lake Landfill in Bridgeton from the U.S. Environmental Protection Agency to the U.S. Army Corps of Engineers. It is unclear whether the DOE has the authority to order such a transfer, or whether doing so would require Congressional approval. Since this map was created by the EPA, new areas of radioactive waste have been found in the north quarry. The letter, signed by Blunt, McCaskill, Wagner and Clay, highlights continuing concerns over the radioactive waste in the landfill. Speaking on a conference call with reporters on Wednesday, McCaskill called the situation at West Lake "a mess" for the families living near the landfill. "What I try and stay focused on is what can we do to help make this go more quickly and more efficiently, to give some reassurance to those families that they are not going to be damaged — their health," McCaskill said. "And secondly, how can we help protect any property values they have in the homes they’ve invested in." On a separate press call Wednesday, Blunt said that the Corps is already cleaning up other, similar radioactive waste sites in and around St. Louis. "So, this is a request to [Energy] Secretary Moniz: tell us why this is a different site than the other sites that appear to be very similar that have already been assigned to the Corps of Engineers," Blunt said. That paragraph could be important, so let me break it down a little bit. A "PRP" is a "Potentially Responsible Party." Under the EPA Superfund program, PRPs are the entities responsible for paying for the cleanup. 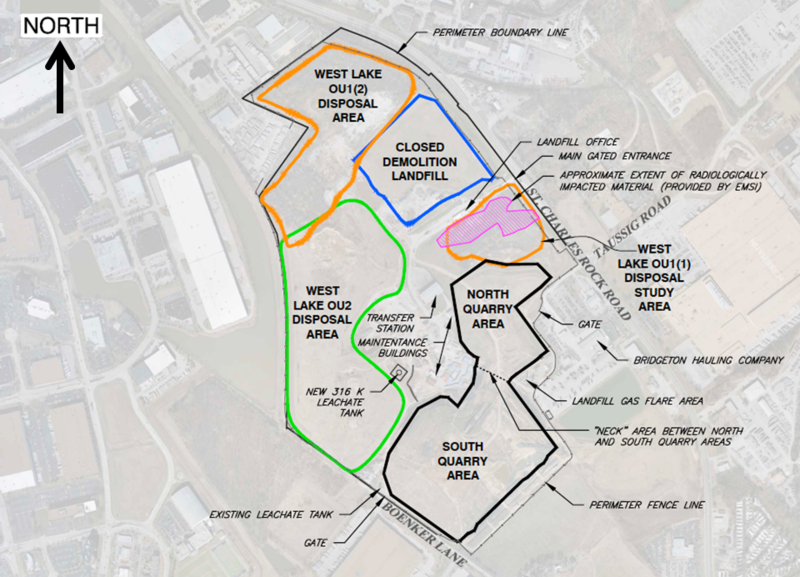 The PRPs for West Lake are the DOE, the Cotter Corporation (formerly a uranium production company), and Republic Services subsidiaries Bridgeton Landfill and Rock Road Industries. The "non-Cotter affiliated material" presumably would be something other than the radioactive waste that a local contractor for Cotter Corp. illegally dumped at the landfill in 1973; specifically, 8,700 tons of radioactive leached barium sulfate cake residue mixed with 39,000 tons of soil. The power company Exelon Corporation owned Cotter from 1974 to 2000. When it sold Cotter, Exelon agreed to retain "certain financial obligations" relating to environmental claims arising from past Cotter actions. At this time, St. Louis Public Radio has not been able to confirm the identity of the PRP raising these "new concerns," or the nature of the other radioactive material. The same members of Missouri's congressional delegation sent a similar letter to the EPA last year, and the Corps has been providing some assistance at West Lake. But area residents have expressed frustration with the slow pace of the cleanup and want the Corps to take over completely. Members of Missouri's congressional delegation have issued a letter strongly urging the U.S. Environmental Protection Agency to turn over responsibility for the clean-up of radioactive material at the West Lake Landfill to the U.S. Army Corps of Engineers. Senators Roy Blunt and Claire McCaskill as well as Representatives William Lacy Clay and Ann Wagner signed the Feb. 28 letter addressed to EPA Regional Administrator Karl Brooks. The U.S. Environmental Protection Agency says it is contracting with the U.S. Army Corps of Engineers to build a fire break to keep an underground fire from reaching radioactive waste at the landfill complex in Bridgeton. The Saint Louis County Department of Health is launching a survey to assess the health of people living near the Bridgeton Landfill. An underground fire has been smoldering at the Bridgeton Landfill since 2010, causing odors emanating from the landfill to increase.